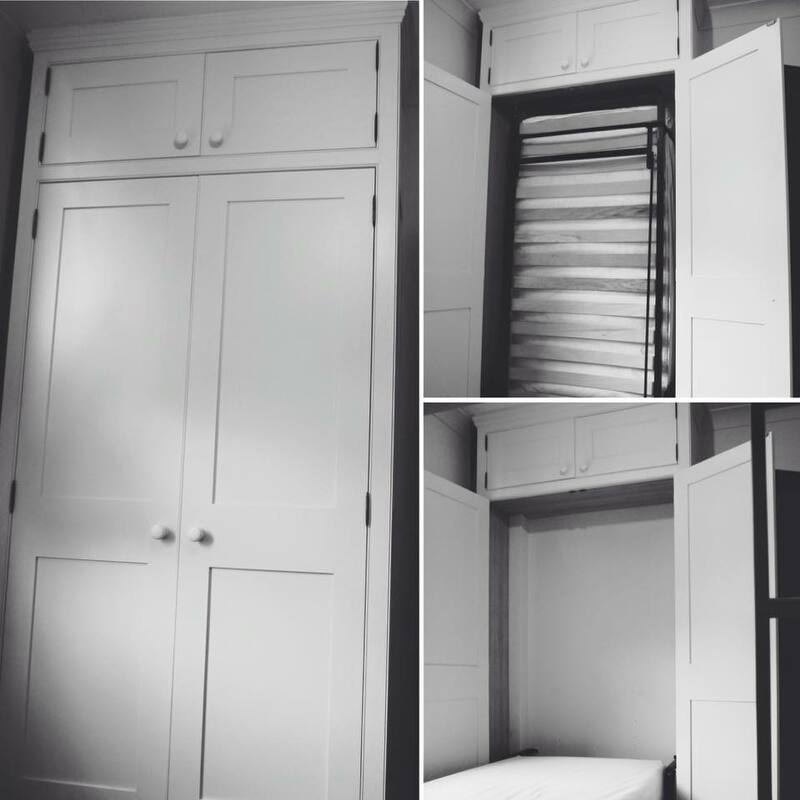 A bespoke Murphy Bed by Dunham Fitted Furniture. Murphy Beds Are Popping Up Everywhere! A Murphy Bed by Clei Compact Living Solutions which folds down over the sofa. Most articles with helpful tips on making small spaces work, almost always include at least a mention of Murphy beds in their list of clever furniture design. But how do you get one? Have you ever seen one while shopping the aisles of your local department store? Is there a big Murphy bed warehouse down a dark alleyway with a secret pass code where only those in the know do all of their Murphy bed trading? Actually, they may be easier to come by than you think. And they can help save space anywhere – even if you do not currently live in a tiny house. There are different types of hide-away beds and the terms for them are often used interchangeably, but there are some subtle differences. A Murphy bed generally folds down from the wall from a vertical position. A fold-down bed is usually one that folds down horizontally. A wall-bed is usually one that has been built into the wall or an alcove area. Having said that, you may see any design called any one of these three names, so make sure that your search is thorough, in order to get the one that’s right for you. A fold down bed from Clei Compact Living Solutions. The same bed folded down into sleeping position. A company located in the UK called Clei Compact Living Solutions offers some beautiful, multi-functional beds which either pull down vertically, horizontally or can even swivel into place. (Think of that last horror picture you saw with the secret bookcase which slides when you push on it). The swivel bed works much the same way, except the front of it usually contains storage and when it is swiveled, it reveals a pull down bed on the other side. Another factor which makes the Clei beds a good choice for any small space or tiny house, is that many of them double as a sofa, a desk or dining table. When the bed is folded down, the legs of the table become the legs of the bed or desk. There is an example pictured here. It’s also worth mentioning that their designs are really quite beautiful as well! A Murphy Bed from Clei Compact Living Solutions which doubles as a bookcase. Another recognized name in the Murphy bed market is Wall Bed King, located in Essex. As the name implies, this company supplies a huge amount of beds which are attractive and fully functional. The beds and cabinetry are very reasonably priced, and they offer a 5-year warranty, along with a 30-day, money back guarantee if you are unhappy with your new bed in any way. They also carry a wide selection of cabinetry in which to surround your bed. The beds mentioned above can be ordered and self-installed. But what if you have an unusual layout to work with, or you have special kinds of cabinetry you would like to see in your living space? In this case, the best choice may be a custom designed bed. Although this may be a bit more expensive initially, you can choose the type of wood or painted décor in order to match the rest of your furniture, and with the help of a master carpenter, you can design the cabinetry to your exact needs, along with some decorative flourishes for a personal touch. Dunham Fitted Furniture in Hexham, Northumberland has been creating custom cabinetry for over 20 years and has built bespoke Murphy beds. They were kind enough to send along a photo pictured here on the left, of an actual bed unit they created for one of their customers that was fitted neatly into a corner space. Last of all, but not least, if you desire a wall bed (sometimes referred to as an alcove bed) you will also need to enlist the help of a master carpenter. These types of beds tend to work well in narrow rooms where the head and foot of the bed are almost the exact width of the room. 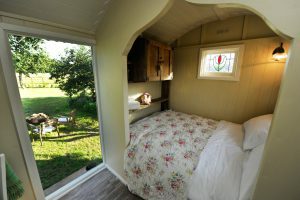 The wall bed pictured below is an especially lovely one created by Round Hill Shepherd Huts of West Sussex. Round Hill Shepherd Hut incorporated this unique bed into their shepherd hut build. A Little Bit of History – The Murphy bed is named after its original designer, William Lawrence Murphy, who patented the beds in the early 20th century.